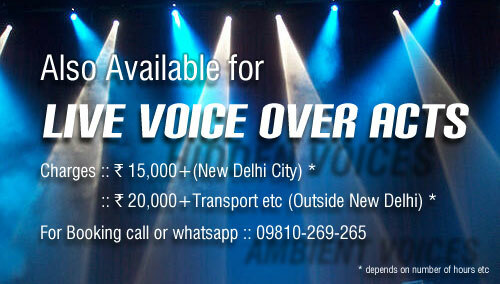 Deepak Agnihotri Voice Over Productions - 9810-269-265, 9990-337-337. Male Female Voice Artist in Indian English, Hindi, Tamil, Telugu, Bengali, Bengla, Malayalam, Kannada, Odia, Oriya, Punjabi, Assamese, Marathi, US English, UK English, Italian, Polish, Arabic, Spanish, Chinese. 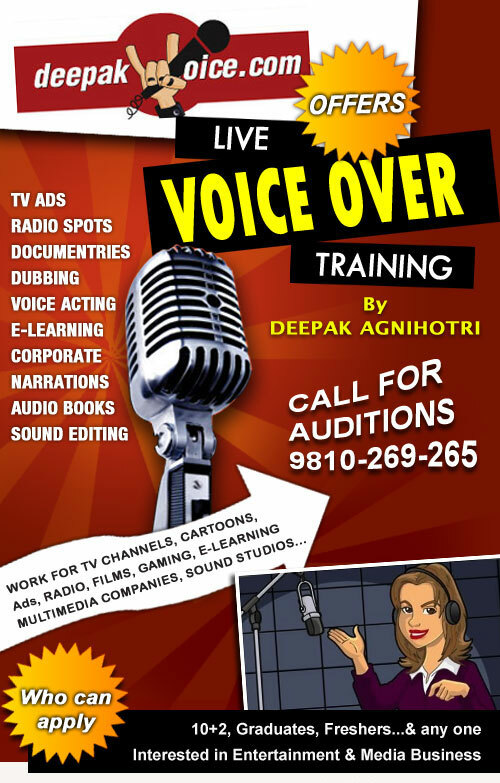 Voice Over training in Delhi at Film Production House. Get Voice Overs & Voice Over Artists in all Indian & International Languages for Your Films, Corporate Narrations, Events, E-Learning Projects, Radio, TV Ads, Voice Acting, Dubbing, Youtube Videos, Voice Over in Dubai, Self Explainer Videos, Games, Animation, Business Promotions, TV Channel Ads, Radio Spots, Business Films, Radio Jingle in Delhi NCR, with Clients all over India, Dubai, Canada, Mumbai, Sound recording Studio, Em Cee, Anchor for Live Shows, Exhibitions, Top Voice Artists in India, Freelance Voice artist. Your one stop Online Voice Over agency, providing Voice Over solutions in Indian & Foreign languages by Native Professional Voice Talents from all across India & World catering to wide ranging Variety, Age & Budget options with super fast turn around time. In Indian context you can listen to some of our voice samples below in this page. Located in New Delhi, India we provide all types of Voice Over Recording services viz. Voice Overs for Corporates, Live Voice Overs for Events, Product Launch functions, Production Houses, Script Translations, Dubbing, Video Editing to our Clients all across India, Dubai & beyond physical boundaries. (Read more). We have all the Regional Language artists (Male, Female, Kids, Teens, Mimicry, Cartoons etc) in our ever increasing Voice Bank .